The Wii remote controller is the heart and soul of the Nintendo Wii console. If you're playing tennis, you'll swing the remote controller around like a tennis racquet to hit shots on the screen. If you're playing Mario Kart Wii, you'll turn the controller like a steering wheel to control your car. So you actually move the remote controller around to control actions on the screen. This makes you feel like you're really in the game and not just playing the game as an outsider. To make playing with the Wii remote even more real, you can buy replica steering wheels, tennis racquets, golf clubs, guns and guitars. Simply plug the controller into them and use them like you would the real thing! The only downside to the Wii console is that it comes with only one Wiimote controller. So you might need to buy an extra controller to play with friends and family. A lot of the Wii's games are party games, and you'll have the biggest blast when playing these games together with friends and family. 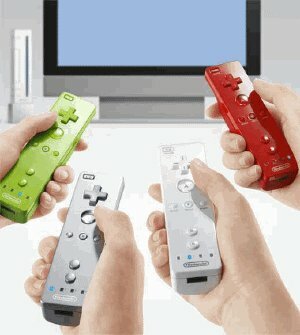 If you are going to be playing games together with friends or family, you'll get a lot of use out of an extra Wii remote. The Wii can have up to 4 Wii controllers connected at the same. This is great for music games or racing games where 4 people can play at the same time. Most games though don’t have an option for 4 players to play at the same time, so one extra remote should be enough. A lot of games also let you share a controller between players. Games like golf and bowling are good examples of games that let players take turns to play. These types of games let you simply pass the Wii controllers around between turns. As nearly every game on the Wii is designed to use the Wii controller's cool motion functionality, the Wii remote is a critical piece of kit that you can't live without! Buying an extra remote controller so you can play together with friends and family is a great investment, but you shouldn't feel like you have to go mad and buy 3 extra controllers in one shot. Think about how many friends you want to play together at the same time. Only if you really need more than one extra controller should you buy more than one. You can always buy more Wii controllers in the future if you really need them. An extra Wii remote costs around $39 in the US and £25 in the UK. I would highly recommend buying your extra remote as part of the Wii Play package. Wii Play is a collection of mini games that comes packaged together with a Wii controller. The Wii Play package costs the same as a Wii controller alone and you get the mini games included. The Wii Play mini games are designed to teach you how to use the Wiimote properly, so it serves as a good teacher for getting the most out of your controller.